The Paw Paw (Asimina triloba) is a small deciduous fruit bearing tree that is native to North America. They grow wild in much of the eastern and midwestern portions of the country, but not in the extreme North, West or South. The leaves are green in the growing season and an elongated oval shape ranging in size from 10-12 inches long. In the fall the leaves change to a rusty yellow in color. When crushed the leaves have a strong unique odor, often compared to that of a bell pepper. The leaves contain toxic annonaceous acetogenins, making them impalatable to most insects. The one exception is the Zebra Swallowtail Butterfly. The flowers have 3 prominent triangular shaped green, brown or purple outer petals. The flowers are insect pollinated, but fruit production is often limited by the small number of pollinators that are actually attracted to flowers very faint scent. The fruit is a green-brown in color and a curved cylindrical shape - the shape of the fruit is very similar to a fat lima bean. The trees produce an almost tropical fruit with vanilla or banana/mango flavors. When ripe, the fruit’s soft flesh is very creamy in texture. The large seeds are easy to remove, making the pawpaw an excellent pick for fresh eating. The short shelf life makes it an uncommon find in most market areas. Fresh fruits of the Paw Paw are generally eaten raw, either chilled or at room temperature. However, they can be kept only 2–3 days at room temperature, or about a week if refrigerated. Many animals and insects make use of the Paw Paw tree and it's fruit. The flowers attract blowflies, carrion beetles, fruit flies, carrion flies and other bettle varieties. The fruits of the Paw Paw are enjoyed by a variety of mammals, including raccoons, foxes, opossums, squirrels, and black bears. Larvae of the Zebra Swallowtail Butterfly, feed exclusively on young leaves of Paw Paw. Chemicals in the Paw Paw leaves offer protection from predation throughout the butterfly's life remaining in their systems and making them unpalatable to predators. Whitetail deer do not feed on the Paw Paw. The Water Oak - Quercus nigra, is a Red Oak with great tendency to hybridise with not only other Red Oaks but also WIllow Oaks. It is a medium to large deciduous tree. Native from Delware to mid-Florida and through Texas, North through Arkansas and up the Mississippi Valley into Tennessee. Very few are found planted in the Western United States. It grows often wild along small streams or wetland areas where lack of water is not an issue, but can also be found in drier more arid soils as well. It is classified as a bottom-land forest cover by the Society of American Foresters. It prunes itself slowly, developing a straight, slender main trunk. Growing quickly in favorable soils, it can add 6-12 inches in a single year. At maximum height it can reach 125 feet tall. The leaves of the Water Oak vary in both size and shape on the same tree, some rounded with ends resembling spoons, some like small Blackjack Oak leaves, and others being more deeply lobed. In color they are a blue-green during the Spring and Summer, changing to a Yellow-Orange-Red in the Fall. The Acorns are round with shallow cups and mature around September of the second year. The bark is finely fissured and a pale to dark grey in color with rough plates. Water Oak is monoecious, meaning the staminate flowers are found in hanging catkins and pistillate flowers are in few flowered, short stalked clusters but on the same tree. They develop shortly before or around the same time as the new leaves. Staminate flowers are produced near the tip of the previous year's growth, while pistillate flowers are produced in the junction of the current year's growth. The "White Oak" - Quercus alba - is one of the most prominent and well recognized trees in our area. It is a long lived tree, with some recorded still living at 450 years. Maryland's famous Wye Oak (in Wye Mills, Maryland) was estimated to be over 450 years old when it was knocked down by a storm in 2002. The White Oak is the state tree of Maryland, Connecticut and Illinois, It's native range is from Quebec in the North, Minnesota in the West and Texas-Florida in the South. It is not a very tall tree, with an average height of 80-100 feet at maturity. The bark is a light grey color with very rigid and noticeable fissures. The leaves are green in color ranging from 5-8 inches in length, changing to a red-brown in the Autumn season. White Oaks will sometimes hold their dead brown leaves over winter, these leaves will fall out in the Spring with the new growth. The wood is pale brown in color, solid, heavy and durable. The acorns appear annually, they are cup shaped and are a shiny brown in color. The White Oak is a food source for many forest animals. Deer and Rabbits will nibble on the twigs and sometimes dead leaves. The acorns are a favorite of Turkeys, Wood Ducks, Pheasants, Jays, Nuthatches and Woodpeckers. The White Oak is also the only known food source for Bucculatrix luteella and Bucculatrix ochrisuffusa caterpillars. The Avocado - Persea americana - tree is a very desirable ornamental, native only to the subtropical areas of Mexico and Central America. The growing conditions must be It's fruit is often included on the seemingly growing list of "super foods", it is very high in vitamin K & B and also contains C, D & Potassium. High Avocado intake was shown in one study to lower blood cholesterol levels. With an average height of just 65 feet, it is a medium sized grower. When planted in pots it is necessary to re-pot quite often as they quickly outgrow small areas. The leaves are an elongated oval shape, deep green in color with a slight sheen on the top. The fruits are either pear or egg shaped with green skin that can range from mid green to almost a black-green and pale green inside. Avocado skin, bark and pits are harmful to many animals and have been recorded to cause severe reactions to dogs, cats, cattle and rabbits. The meat of the Avocado is smooth in texture and is often compared to butter in flavor. It is very often used in Vegetarian cuisine as a meat substitute because of it's high fat content. It is also commonly used in California Rolls, Guacamole, Sandwiches, Salads, Soups and Sauces. Commercially in the United States, Haas Avocados are the most known/marketed type even thought there are dozen of other cultivars grown worldwide. Avocado fruits are climacteric, meaning they mature on the tree but don't ripen until taken off. They will only ripen if mature, so if picked early the ripening process will not occur. The Banana is another fruit in the climacteric catagory. Most Avocado crops produce the best crops bi-annually with poor yeilds in the off or in between years. Once off of the tree the fruit will ripen within a two week period, if left on the tree to long the fruit will eventually fall off on it's own. Avocados can be grown from seed, although it will take the new plantings 4-6 years to mature and bear fruit. Indoors you can also grow Avocados from the pits in water, holding them near the surface with toothpicks, once the stem reaches an inch or two you can transfer it to soil. The Mountain Ash -Sorbus americana / Sorbus decora- is a small deciduous flowering tree or shrub. It is native to Eastern Canada, the Northeastern US, North-Central US (Michigan, Minnesota, Wisconsin), and a small portion of the South Eastern United States along the Appalachian Mountains. It occurs naturally in valleys, on upland slopes and within coniferous forests - but can be grown as an ornamental as well. The Mountain Ash is often compared to the similar European Rowan which has been naturalized in many portions of North American where the Mountain Ash is native. The Mountain Ash produces large clusters of berries that remain even through Winter (unless eaten by birds). These berries are a favorite of Grouse, American Robins, Thrushes, Waxwings, Jays, Squirrels, and Rodents. The leaves have 11-17 toothed leaflets growing across from on another on a single stem. The flowers appear when the leaves are fully formed (May - June) with five separate creamy White petals and a butter colored center. The bark is a light grey in color, smooth to the touch and scaly with age. The leaves appear as a yellow green during the growing season changing to an almost transluscent yellow in the Fall. The Engelmann Spruce - Picea engelmannii - is a medium/large Evergreen tree. Growing in a tall and conical form with an average height of 80-130 feet tall, with few recorded to reach heights of over 200 ft. The bark is Grey, thin, scaly, flaking off in circular sections revealing an Orange color in sections below. Male flowers are a dark purple and Female are a reddish/purple, the flowers develop into shiny light brown cones that average 2-2.5 inches long. The cones form at the ends of the twigs during the Spring growth season. The Engelmann Spruce is native through Southwest Canada, through the Cascade, Monashee, and Selkirk Mountains, continuing South through the Rocky Mountains and portions of the Pacific Northwest. It is often confused with the Blue Spruce, White Spruce, Black Spruce, Norway Spruce and Sitka Spruce-many of which take over in growth ranges where the Engelmann leaves off. The seeds are black with slender brown wings. Engelmann Spruce wood is harvested for both paper-making and general construction. Wood from slow-grown trees such as this variety growing at high altitudes have a specialized use in the making of musical instruments such as acoustic guitars, harps, violins, and pianos. The Ohio Buckeye- Aesculus glabra - is a medium sized rounded crown Deciduous tree. Growing to only 20-40 feet tall at maturity, it has a moderate growth rate. It is the most widespread of all of the Buckeyes in North America. It's range is on mostly mesophytic sites through Western Pennsylvania, Ohio, Southern Michigan on West to Illinois and Central Iowa, extending South to Kansas, Oklahoma, and Central Texas; East into portions of Arkansas, Tennessee, and Alabama. This tree thrives best in moist locations and is most frequently found along river bottoms and in streambank soils. It has been planted frequently outside of it's native range in Europe and the Eastern United States. Different from the other Buckeyes because of two main features, first the leaflets have barely any visible stalk and second the husk of the fruit has short spines. The Ohio Buckeye is sometimes referred to as the American Buckeye, Fetid buckeye, and Stinking Buck-eye, the last because of the foul odor emitted when the leaves are crushed. "Buckeyes" has been the official Ohio State nickname since 1950, but it had been in common use for many years before. According to folklore, the Buckeye resembles the eye of a deer and carrying one brings good luck. Recommended for Hardiness Zones 3-7, Buckeyes are found in larger nurseries within their growth range. The Catalpa is a Medium sized deciduous tree. 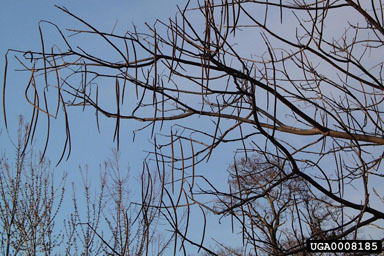 The northern catalpa grows to a height of 40–60' and a spread of 20–40' at maturity. There are two main types of Catalpa grown in the United States, The Common/Southern Catalpa (Catalpa bignonioides) and Northern/Western Catalpa (Catalpa speciosa). The Common Catalpa is a messy tree and should only be planted in areas where it's fruit and flowers are not an issue. The Northern/Western Catalpa is a taller variety then the Common, it is a very hardy and a fast grower. Catalpa are in the Bignonia Family, along with the Trumpet Vine. There are only 11 species of Catalpa, the species are divided between North America, the West Indies and China. Both varieties are found growing wildly in the majority of North America, with the exception of regions that are extremely dry and arid. Flowering occurs in the middle of Summer but the Common and Northern Catalpa flower about three weeks apart. The flowers are showy and White, borne in wide upright spikes. The induvidual flowers have small orange blotches and stripes as well as purple spots inside. Leaves are very large up to 10 inches long and dull green in color. The leaves grow in opposing pairs or groups of three. The fruits are long, thin, green pods that turn brown when ripe and split into two. Northern Catalpa is recommended for zones 4-8. This tree is considered a shade tree, a flowering tree and an ornamental tree. It features a spreading canopy capable of blocking sunlight, blooms profusily of spring flowers and adds visual interest and beauty to landscaping. It is readily available at most nurseries in the native growth range.